The asparagus is up in our garden now. You have to look carefully because it’s easy to miss the little spears when they first appear on the scene. Our bed seems to be a bit behind the others in the neighborhood—at least one of our neighbors reported seeing the asparagus poke up a week before we saw ours. Even so, this is usually the time of year that you begin to see the asparagus. Here is what the young asparagus typically looks like. You can see the asparagus spear about in the center of the picture. Over the last several years we’ve decided that we really need to plant more asparagus. Having just one row in the permanent bed isn’t sufficient to meet our needs. Yes, we have more than sufficient for meals in the spring, but there is nothing left to freeze for later use—even if the later use is sometime during the summer months. So this spring we decided to plant some more asparagus. You can plant asparagus seed, but we’ve never had very good luck with it. What we’ll get instead are two year old roots when we can or year old roots when we can’t. The roots come in a bundle of about twelve. The roots are attached to a crown. Make sure you pick a sunny spot for your asparagus—it loves the sunlight. 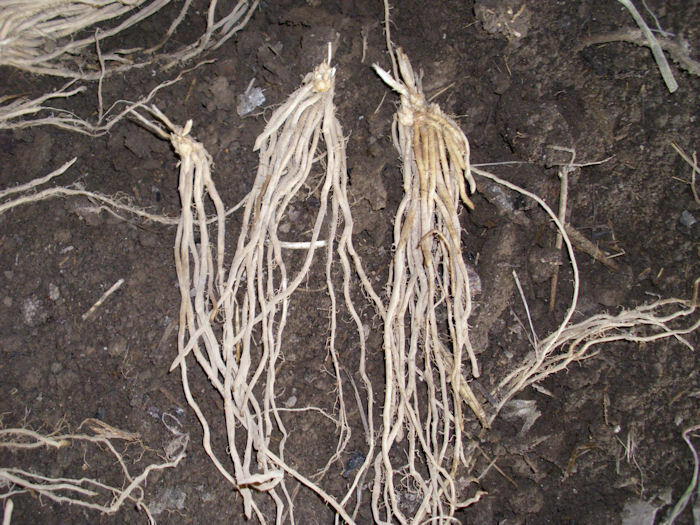 Here are three asparagus roots attached to a crown. In addition to the bunch of roots, you need a good spade. 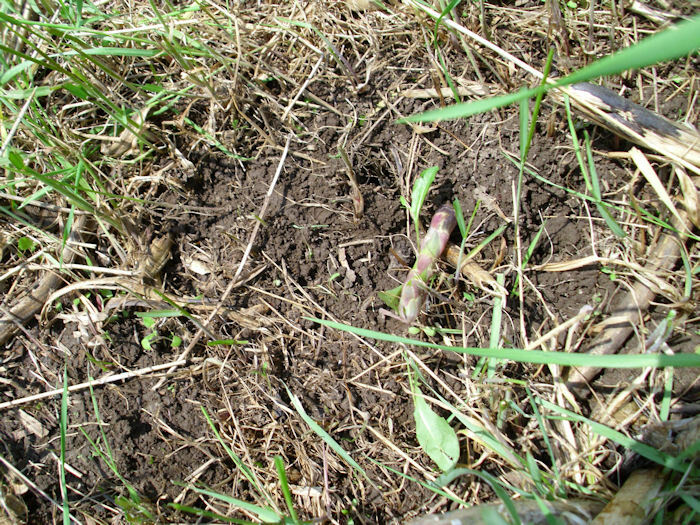 Most experts recommend planting asparagus in a mix of soil and compost. Because our soil is heavy with clay, we used pure compost from our compost heap. The best advice I can provide is to have your soil checked by your local testing facility (making sure to tell them precisely what you intend to plant) and then ask advice on how to proceed with your specific soil. The procedure for planting roots of any age is the same. 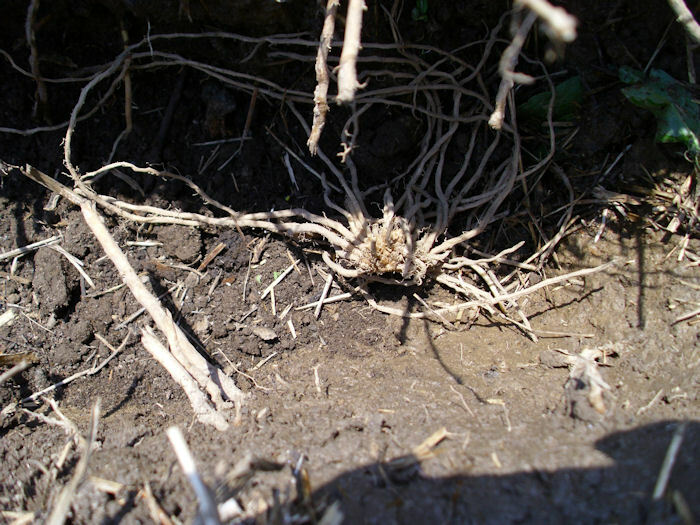 You begin by measuring out a trench that will allow two-feet for each root in your bunch. If you have a standard bunch, that means digging a trench 24-feet long. The trench is 16-inches deep and about 6-inches wide (the width of your spade is fine) as shown here. The mulch is important. We use hay mulch to help control weeds, keep the ground moist, and reduce the amount of erosion/filling that occurs when it rains. This is actually last year’s mulch—we’ll do some clean up and add new mulch for this year. Fill the bottom two-inches of the trench with loose compost and/or soil. Don’t pack it down—keep things loose. Splay the roots in the trench two-feet apart. Make sure the crown is pointing up as shown here. Carefully add eight more inches of compost and/or soil over the top of the roots. Of course, this leaves six-inches of that trench uncovered. What you’ll do is wait for the asparagus to come up. 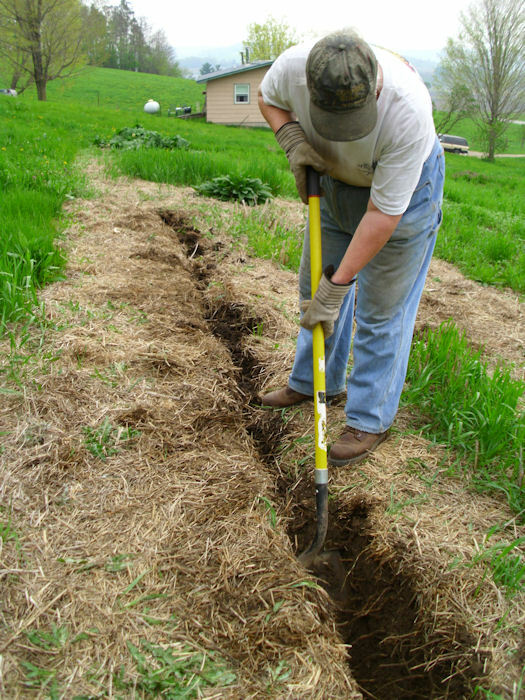 As the new asparagus grows, you’ll fill in the trench a little at a time until the trench is full. This step takes until mid-summer in most cases, but could take more time. I’ll visit this topic again as the summer progresses. In the meantime, let me know if you have any questions at John@JohnMuellerBooks.com.